I was in high school and the parents of a friend of mine was planning on having a huge summer party. They were looking for some help in preparation, so I went over and helped out. Most of what I did was carrying tables and chairs, hanging decorations and other manual labor. 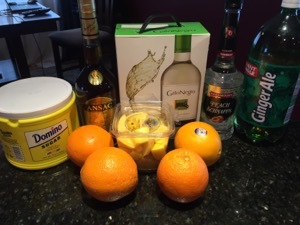 As the time ticked away before the party began, my friend’s mom asked me to make the sangria. The what? I hadn’t heard of sangria before. She led me to table with quite a bit of fruit and asked me to start cutting it up. Then came the wine and other ingredients. Most sangria is made with red wine, but for those who only like the white, here is a good alternative. 1. In a pitcher, combine peach schnapps, cognac, sugar, sliced oranges and sliced mangos. Chill for at least an hour. 2. 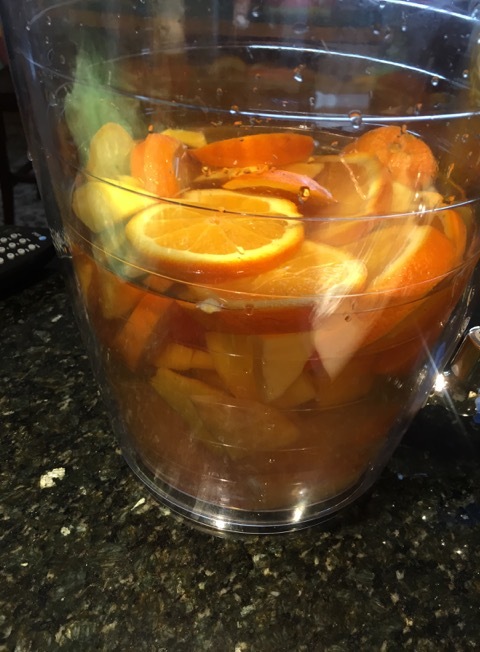 Pour fruit mixture into a large punch bowl. Stir in white wine and ginger ale. Yum! I used to love the white sangria at Ground Round, back in the day.